The Blades made it fourteen games unbeaten with a late, late goal to see off plucky nine men Bury at Bramall Lane. It was a night that for the most part saw a great deal of frustration as United dominated from almost start to finish. 21 shots on goal to 1 from Bury but the Blades could not find the elusive goal until right at the death. As with Saturday, the opposition lost a man to a horrible late tackle with former Blade Jacob Mellis ridiculous lunge on Matt Done but the Blades has struggled to break down a resilient Bury side. Chances started to come as the game went on but good saves, goal line clearances and deflections somehow saw the Bury goal stay intact. A further Bury man was sent off as Leigh committed a stupid tackle on Coutts to get his second yellow after being cautioned for time wasting earlier in the game. However it seemed the goal would not come until a late well worked move saw Coutts one two play in Ebanks Landell who coolly converted home at the Kop end. Manage Wilder had to do without two of his injured trio from Saturday’s game with Duffy and Freeman missing out replaced by O’Connell and Scougall. Coutts was fit to take his place. Basham began at right wing back and Scougall just behind Sharp and Done. Bury had conceded ten goals in two successive game at Wimbledon and were on a dreadful run having lost eight successive games. 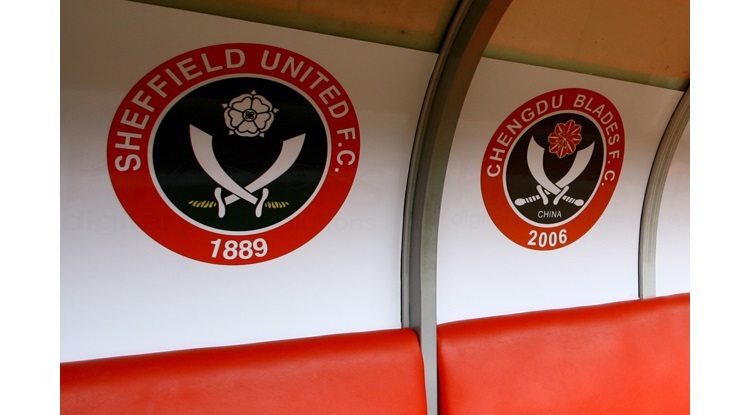 They still fielded a number of experienced players such as Anthony Kay, Leon Barnett, Tom Soares, Tom Pope and James Vaughan with former Blades Jacob Mellis also starting. The early proceedings saw the game stop start with referee penalising Leigh for trying to gain yards on a throw and then opted not to give a penalty after Barnett’s physical challenge on Scougall. Coutts and Fleck saw a lot of the ball and whilst Bury had 2 up front with Vaughan and Pope, they had two banks of four and were putting all of these behind the ball at every opportunity. The ball was being switched to Basham who seemed to be a spare man at every chance but the Blades struggled to create anything of note until Sharp knocked it over after Laffery’s pull back. Coutts then forced Williams into a save and he gathered at the second attempt. It was all United and they were dominating the game. Some of the build-up was a little ponderous but the crowd were remaining patient and kept with the side. They moved it side to side but Bury were closing the openings and United could not find a way through. Williams was timewasting on every goal kick but referee Joyce decided to ask the Bury captain to warn his keeper rather than do it himself! It was become a little frustrating as Bury had no intention to attack at all. However, a golden chance came when Sharp crossed and Lafferty from right in front of goal somehow headed over. It looked easier to score and a bad miss. United were trying to be a bit more direct and two crosses from O’Connell saw Basham head over when well placed and then an even better cross saw Scougall flick his header onto the bar. This was another decent opportunity. Good football saw a number of players involved and Scougall put over a great cross but Done’s effort whilst powerful was well saved by Williams. Just before the break the ball dropped near the dug outs and Mellis made a wild lunge on Done. It was high, late and horrible and the red card that followed was no surprise. Pope was booked for remonstrating in the aftermath but what the former Blade no one could be quite sure? It made a hard task even harder. The second half saw Clarke come on for Scougall as United knew they had a man advantage and wanted to give themselves more striking options. Bury had barely ventured into the United half but did have a rare opening as Leigh ran forward and hit a decent driven effort not far wide that saw Moore struggling. This let off saw United come back onto the initiative and Kay headed clear. The Blades won two corners in a row and another scramble saw the ball cleared. A deflected effort saw Williams scrambling across to keep it out and O’Connell headed over when well placed. It was one way traffic and was a game of attack v defence. Done then headed over before Wright was sacrificed for Chapman as United tried to get more attacking threat down the flanks and switched to a more orthodox back four although Basham and Lafferty were going forward as was Ebanks Landell. Bury were just sitting in and hoping to keep United out. Chapman finally got to the by line after a period where United had tried to cross from too deep. This first bit of penetration for a while saw the ball come over and Clarke’s header was cleared off the line. This was a theme of things to come. Fleck then burst into the box and seemed to be unceremoniously bundled off it by Vaughan who made no play for the ball. The referee had a long hard look at it but waved play on. Lavery came on for Done as the game entered the final 10 minutes. The crowd were still with United but frustrated by Bury’s tireless effort and solid defending mixed with some spoiling and timewasting. With all the other top teams winning, the pressure seemed to be ramped up even more. Clarke nodded home but was adjudged to have fouled his man and also took a knock himself in this incident and needed treatment. With five minutes to go, Bury were reduced to 9 men. Leigh had been booked earlier for timewasting and then his poor tackle on Coutts as the United man threatened to get away saw a straight forward yellow card and his second. So United were facing 9 men again but this time only had limited time to force that late goal. Fleck fired over and then Basham nearly got in before Chapman’s flick did not quite work. Then soon after a deflected cross was hit goalwards but Kay somehow cleared. It was like the Alamo or Rourke’s Drift and Bury had a thou shalt not pass attitude. Ebanks Landell had joined the strikers and now had 9 or 10 men against 8 men in the final third. The game ticked into stoppage time with 6 minutes allotted. It seemed United had got the breakthrough after Lavery had crossed and it fell to Chapman but his shot that beat Wiliams was somehow hacked off the line by Kay with the Kop up ready to celebrate. With three minutes of stoppage time to go, finally the goal came. Lafferty and Coutts linked well and the latter played a clever one two before crossing into the box picking out EBANKS LANDELL and the big centre back coolly sidefooted into the corner. The noise was deafening and it was as if the Kop had almost sucked the ball into the net. Manager Wilder set off on a wild celebration of his own towards the South Stand. It was a vital goal and the reactions of the players and fans of the two respective sides told the story. The Blades players piled onto Ebanks Landell in front of the Kop whilst several Bury players law strewn in the box. The final moments just saw United play keep ball before the final whistle came and saw another win and whilst it had been right at the death and an odd night; as with Saturday, all that mattered was another vital three points. United – The sense of relief was clear at full time. We had dominated the game and batter them for possession and chances but it seemed it was not going to happen. I would say we may be made poor decisions in the last third and the play could have been quicker. We also could have got wide more, stretched them more and maybe even shot more. At times we tried to walk it in! However we are facing sides that are coming to just defend with banks of 4/5 in defence and midfield and teams are barely even attacking at the moment against us. They are time wasting and spoiling and being quite cynical (two teams to go down to nine is incredible really). We are having to basically be patient, keep the ball and wait for chances. We did not play poorly and for most of the game kept the ball. The last third could have been better and we did not quite make the right balls or get the ball into the box when we had chances but they had so many men behind the ball. It made it hard and I don’t want to be so critical of United when faced with such negative, defensive tactics. I have criticised Duffy but we missed his invention and play in the last third tonight. Despite some of the above faults we still created lots of chances, many half chances and maybe not enough clear first half (Lafferty header apart) but second half they cleared to off the line, we had a few other good chances and still did enough to win the game. Coutts and Fleck controlled midfield, the defence looked untested and we kept the ball really well. You felt the weight of possession would pay off. Eventually it did. That is the difference this year. We are going for wins and goals and it is paying off. Big credit to fitness team as we are outworking teams. They are getting tired from all the possession we are having and leading to some bad tackles either out of frustration or fatigue. It was a crucial win in the end and you felt a defining kind of game especially with all the other top teams winning. Scunny keep winning as do Bolton. You get the sense the top 4 or 5 might be breaking away and we have to keep winning. We face a hard game at a Charlton side who have had two great wins and will be a different game but that might help us as they will not sit in like others have. Hopefully we can keep the run going. A draw would not be worst result with two more home games to come against two poor sides in Walsall and Swindon at the Lane.